German director F.W. Murnau’s silent masterpiece Sunrise: A Song of Two Humans (1927) is a rare example of a foreign auteur who managed to keep his vision in the face of the Hollywood machine. Prior to this movie, F. W. Murnau was arguably the most important film director of his time. He directed a string of German Expressionist works that were as bleak and brooding as they were technically brilliant. Murnau’s eerily, hallucinatory Nosferatu (1922) redefined the horror movie. The spectacularly depressing Der Letzte Mann (1924) featured a roving camera, double-exposure and forced perspective to brilliantly evoke the shame, humiliation and (in one tour-de-force sequence) drunkenness of a proud doorman demoted to a washroom attendant. And his adaptation of Faust (1926) was the most lavish, expensive movie Germany had ever produced at the time. Enter William Fox, a Jewish-Hungarian immigrant who founded the Fox Film Corporation. Though his studio was moderately successful producing Tom Mix serials, he aspired to something greater; he aspired to art. Fox convinced Murnau to make the jump to Hollywood, in part by agreeing to build a $200,000 set for the movie -- an astronomical sum in those days. This song of the man and his wife is of no place and every place; you might hear it anywhere at any time. For wherever the sun rises and sets in the city’s turmoil or under the open sky on the farm, life is much the same; sometimes bitter, sometimes sweet. Murnau and his screenwriter Carl Meyer (who also wrote Der Letzte Mann) made the plotline so simple, so universal that the characters don’t even have names. A struggling farmer is smitten with a femme fatale from the city. She inveigles him to drown his young wife and run off to the city with her. But when it comes time to do the deed, he realizes that he can’t do it. When the wife flees from him, he follows her into the city, apologizing profusely. Eventually, he and his remarkably forgiving wife reconcile and rekindle their love for one other. The story is so elemental that it could be a fairy tale. Yet Murnau’s ability to spin absolutely dazzling images -- using technology perfected in Germany – is what makes Sunrise so memorable. At one point in the movie, the camera seemingly floats over a crowd in an amusement park; at another the lovers walk down a city street that, without a cut, transforms into a flowering meadow. Compared to his Hollywood contemporaries – D.W. Griffith for example – Murnau’s movie seems vital, modern, and surprisingly poignant. 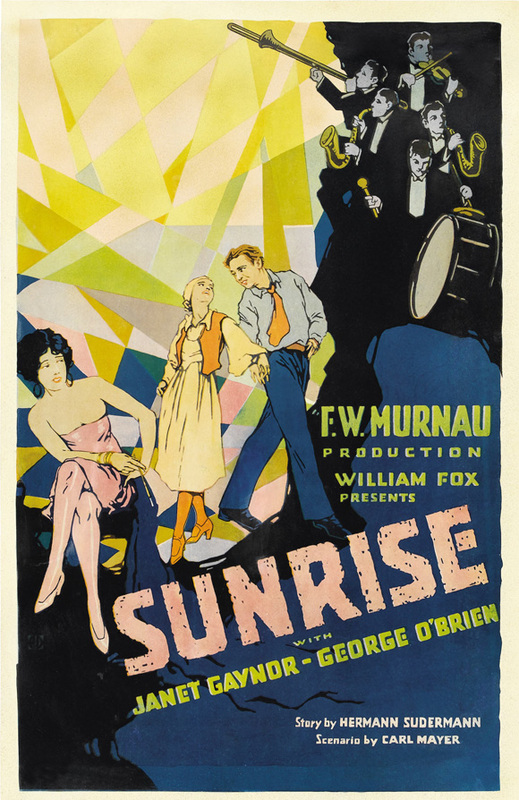 Though the movie earned a few Oscars – including one for Best Unique and Artistic Production and one for Best Actress for Janet Gaynor -- Sunrise suffered the fate of many cinematic masterpieces: It flopped. Yet over the years, its critical reputation has only grown. In 2012, it was named the 5th best movie of all time by Sight and Sound magazine just ahead of 2001: A Space Odyssey. Unlike Kubrick’s sci-fi saga, however, you can watch Sunrise for free on Archive.org. Check it out. Also find the classic on our list of Great Silent Films, part of our larger collection, 1,150 Free Movies Online: Great Classics, Indies, Noir, Westerns, etc..